Okay, let’s start with the obvious: Mammoth Mountain is having a VERY good winter this year! And even as we head into spring, winter continues to make its presence well known to all. Nestled in the Sierra Nevada mountain range of Eastern California, Mammoth Mountain has received a record amount of snowfall this year. The ski resort received as much as 24 feet in a single month alone and has managed to accumulate over 645” of snow at the summit. With continuous reports of packed powder and machine groomed cords, the surface conditions couldn’t be better. For our family, spending time outside together is a high priority. If we’re not skiing, you’re almost guaranteed to catch at least one of us surfing, mountain biking, golfing, or doing some type of outdoor sport. Our home base of Bend, Oregon caters to this type of active lifestyle, but there’s something to be said about being able to get from snow to sand in under two hours here in California. Both Jenise and I have family in the San Clemente area, so it’s always a joy to be able to kick back and catch up with them, too. We’ll be heading up to Mammoth Mountain on Saturday, March 23rd to host our last official Family Ski Day of our Season #1 Winter Tour and couldn’t be more excited to burn some turns with you. And in case you needed a little added incentive, here are four reasons to come ski with The Big Ski Family at Mammoth Mountain. Our best experiences and happiest moments in life are the ones that are shared together. Studies from Psychological Science have reported that sharing experiences — even with complete strangers — makes people rate those experiences as more intense than people who underwent them alone. Shared experiences facilitate an opportunity to bond, learn, and feel that wholesome sense of community that just makes your heart feel good. For us, hosting Family Ski Days isn’t about skiing with folks who are top skiers, have the latest high performance gear, or were first in line to buy a season pass. It’s a time for us to strip status and get real about what’s important in life. It’s about showing individuals and families alike that when you consciously make an effort to get together and invest in experiences (not just “things”) with others, you’re much more likely to experience genuine, fulfilling happiness as a result. #2 Help us wrap up our Season #1 Winter Tour with a BANG! Yes, folks, you read that correctly: our Family Ski Day at Mammoth Mountain is the last official ski spot on our Season #1 Winter Tour. Since January 2019, our family of 13 has skied at over 15 different ski resorts in six different states. If you’ve been following us on Instagram or checking out the rest of our blog posts or video updates on YouTube, then you know the ups and downs we’ve faced. From getting caught up in some major ice road detours and taking ski poles to the face to nailing some of our very first backflips and sending it at Corbet’s (coolest videos ever! ), this has been a dream come true for our family. We set out on a mission to introduce 1 million families to the joys of skiing together and have been overwhelmed with the amount of love and support we’ve received from different people we’ve met along our journey. When the children were little, we had trouble keeping track of them on the slopes. So we bought them bright matching ski jackets which worked like a charm. Even at the most crowded ski resorts, our kids were easy to spot. Then one day the kids found one of my old bright colored ski suits from the 80’s in storage. They thought it would be awesome if we all wore something similar when we were on the mountain skiing together, so we bought some online. The rest is history! Seeing 13 bright neon onesies all together on the mountain is quite the sight and sure does make heads turn. 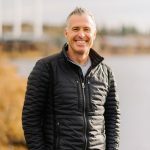 It’s funny how something so practical — Jenise and I’s desperate attempt to help make skiing together with all of the kids a bit more manageable — slowly evolved into something that makes our family just plain happy. Plus, we still get a good chuckle every now and then seeing all of the kids in them ripping down the mountain. Now the neon onesies are basically a skiing family tradition for us! We’ve been giving away a TON of awesome prizes at the different ski resorts we’ve visited. Everything from socks and free drink vouchers to beanies and our custom made stickers. We post exclusive hints and tips on where you can find these different prizes on our Instagram Stories and have loved the positive response that we’ve received from folks! Even if you miss us on the mountain, make sure you still get in on the scavenger hunt action. 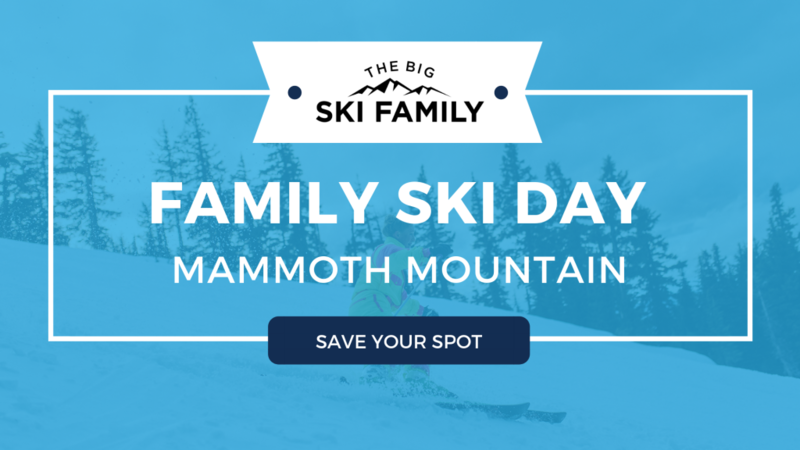 Ready to join us for our Family Ski Day at Mammoth Mountain? RSVP now, buy a lift ticket from the resort (or grab your Ikon Pass), stay tuned for updates (and scavenger hunt clues!) on our Instagram, and get ready to rip!